Light House Cottage01263 715779work01603 870304fax Self-cateringEnjoy a relaxing break in this newly converted accommodation which has been finished to a high standard and is all on one level. Light and airy, comfortable and family friendly Lighthouse Cottage is one of three cottages located in a quiet location close to the Norfolk Broads and the east coast, making it an ideal base with which to explore this beautiful part of the county. Perfect for cycling and walking this area is adorned with peaceful and quiet country lanes then, after a days exploring, wear the children out at the communal play area, tuck them up and unwind in the fully enclosed patio garden with a chilled lemonade...or something stronger! • Pets: Two dogs welcome, please see our booking information regarding pets. • Other: Towels. Cot and Highchair, Books and games provided. WiFi. • Outdoors: Fully enclosed patio, gas barbecue, table and chairs. Communal play area. • Mobile phone signal: Variable. Light House Cottage offers weekly bookings starting on Saturday. Enjoy a relaxing break in this newly converted accommodation which has been finished to a high standard and is all on one level. 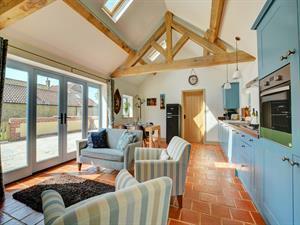 Light and airy, comfortable and family friendly Lighthouse Cottage is one of three cottages located in a quiet location close to the Norfolk Broads and the east coast, making it an ideal base with which to explore this beautiful part of the county. Perfect for cycling and walking this area is adorned with peaceful and quiet country lanes then, after a days exploring, wear the children out at the communal play area, tuck them up and unwind in the fully enclosed patio garden with a chilled lemonade...or something stronger!